Each time I pick up an Ania Ahlborn book, I'm struck by her gift for storytelling. She has an unnerving ability to draw you into situations that are downright twisted, and make you want to stay there— and THE DEVIL CREPT IN is no exception. In this masterful and chilling horror novel, Ahlborn draws the reader into a story of evil things that surely can't be real... but just might be. THE DEVIL CREPT IN begins with a simple premise: a boy (Jude) goes missing, and his younger cousin (Stevie) is determined to find him. Stevie has always been different - prone to seeing things that just aren't there. But with Jude gone, Stevie's imagination really begins to run wild. What is that shadow lurking on the outskirts of town? And what about Max Larsen, another boy who disappeared a few years earlier? Soon Stevie's personal investigation into his cousin's disappearance will draw him into a years-old horror more terrifying than he could ever imagine. I have to say, I think sometimes horror books get a bad rap. Just like crime books, skeptics can sometimes write off horror books as somehow "easier" - easier to write, easier to read. Ahlborn's writing should be proof enough that horror writing is as much an art as any work of fiction. THE DEVIL CREPT IN has all the subtlety and intelligence of any family drama. Its intentional plotting and lifelike descriptions round out the read, making it impossible to ignore the skill of its author. My favorite aspect of this book was how intentionally Ahlborn lays out her plot. This book begins quite gently, lulling the reader into a false sense of security. Readers are immersed in Stevie's thought process, becoming familiar with his unique habits and ways of viewing the world. And just when readers begin to wonder whether they're really going to be scared by this book, Ahlborn pulls the rug out from under them, revealing a parallel storyline that will deliver all the chills and gore a horror reader might wish for. As the book progresses, these storylines will intersect - with disastrous results. Don't expect this book to come out of the gate with in-your-face scares; just sit back and trust that Ahlborn is setting you up to be very afraid. Ahlborn is never excessive, though - even when her story does take a dark turn. Yes, there will be blood and guts and otherworldly evil. But never in excess. Ahlborn knows exactly when and where to drop these moments of violence for maximum effect, keeping her readers on their toes. She also does an excellent job blending supernatural horror and horror that's all too man-made. 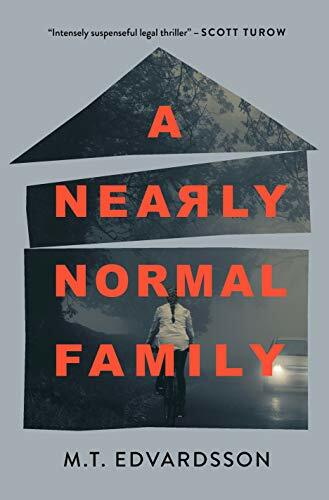 I'm very particular when it comes to thrillers with a supernatural bent, and Ahlborn's story had just the right balance for me: something otherworldly is happening at its core, but the book's vivid cast of characters kept it grounded in reality, and made it all the more frightening. Whether or not you typically read horror, I'd bet that after reading this book, you'll agree that Ahlborn is just a great storyteller. Her writing is beautiful, even when she's describing the ugliest things. I highly recommend THE DEVIL CREPT IN for a bone-chilling, addictive horror story. Thank you to Gallery Books and Ania Ahlborn for the review copy! All opinions my own.